The DX-100, What to do now? It started for me with the purchase of the old DX-100. There I was, riding on the trailer being driven by “Tina” W1IA at the Hoss Traders Hamfest a couple years ago. We had been working on a Keg all night and I was primed to find a 19” rack mountable transmitter that could become the heart of a good old fashioned Triode “Old Buzzard” radio. After all, I had finally exceeded 50 years and had the rubber gloved exam so I figured it was time to just “do it”. There she was, all dirty and abused. I looked inside and all of the modulator transformer wires were twisted together, taped & shoved into an open hole in the chassis. Sorta like those 15 transistor radios we used to buy in the 60’s from Japan! Well since I did not need the modulator anyway I figured all the parts I would need were probably on that chassis. I started construction by removing the original modulator & giving away the parts to people trying to get DX-100’s up and running themselves. I still have the original Mod transformer and main plate filter choke if anybody needs them. What you may end up using for your project will vary from me but my DX-100 needed some re-engineering before I could consider using it. The first thing was to install a couple relays that would key up the radio when 28 volts was applied. I decided all of the logic to bring the beast to life should be controlled by 28 volt relays because they are cheap and I had a 30 volt power supply that would work just pissa for this. I then solid stated all of the power supplies in the radio and added a couple VR-150 tubes to give me a nice stiff low voltage to work with. The VR-150’s fit right in where the old rectifiers used to live. A critical mod was to run the 6146 final screens off of the regulated low voltage NOT through the dropping resistors coming from the 700 volt supply. This was not a modulated stage so I did not need those big heaters in the radio any more. Now you have regulated screen voltage for those finals. You can screw around with the screen voltage to fit the manufacturers specs. By swapping other regulator tubes into the sockets. I lost (4) 6146 tubes before I measured the 450 volts that the original resistors placed on the screens. The plate power supply of the DX-100 will need to be modified to supply around 1400 volts for the 845 Driver tubes used in the final design so swap that over to a full wave bridge & add some more fitters & bleeders for this task. I was able to remove the original huge filter choke and replace it with (2) smaller chokes of about 10H each. This let me keep the 700 and 1400 volts reasonably regulated to feed the new driver & the 6146 RF finals on the DX-100. Now comes the fun part. Make a piece of aluminum fit over all the area of the original modulator parts that are just holes in the chassis. You have room here for the two dual section tubes you need for the pre-amp and the phase splitter and also mount a low voltage choke on top of the chassis to conserve room below for other parts. Wire the phase splitter as I have drawn it. You will notice that the first stage is a 12AU7 running grounded grid & cathode driven. This makes a pissa way to go from my Lo Z, 600 ohm audio string to the high impedance of the tubes. Since I do not need to have much gain in the preamp because the 600 ohm audio system can deliver several volts of audio to the transmitter input, I used a nice lower gain, quieter 12AU7. Use good building practice here. This is where the hum and noise tends to be generated. A common ground bus and tube shields are always a good idea to keep down the noise. Use shielded wire to come in and out of this circuit. I guess you could also add a input transformer but I tried to just R/C couple all of the tubes right up to the 845 grids to give me the best possible audio response. Now we have a “Power VFO” that can deliver up to 100 watts and the phase splitter to drive the 6J5’s on the driver deck. Clean up the old DX-100 and make any necessary repairs to the old rig before proceeding. You can verify the audio system with your scope. It’s a good idea to check each stage’s gain & performance with your scope. I guess you could also un-ground the first grid and add a 10 meg grid leak resistor and blocking cap if you want to use a Hi-Z microphone. If you do this you will need to change the values of the pre-amp plate resistors and go back to a 12AX7 to get the proper gain for your microphone. PS, you don’t want to do that. It’s time you got a nice microphone and an audio processor or two or three on line and generate that true Hi-Fi East Coast studio sound. Now you need a power supply with enough scrot to drive the finals, modulator, and 4-400 IPA stage of the final beast. I tried a 4500 volt transformer that running full wave, cap input could only come up with 2500 or so volts. This worked but never quite right. I swapped over to a Gates BC1T power transformer that has 3500 volts at 2 amps available. Running that through a full wave bridge with choke input gave me about 2900 volts going into the mod reactor string. That worked FB-OM. You should also have a step start relay to power up the primary. That’s where a “Xmtr-ON” signal of 24-30 volts is very handy. This keys 110VAC coils just as good as the 28 VDC ones & lets you figure out the proper R/C needed to give a ½ second delay to the second relay that shorts out the in-rush current resistor. Works pissa and is simple. You may want to consider a couple zero crossing solid state 40 amp 220 VAC relays here. I get some spectacular fire from the relay contacts and had to add a .1 & 100 ohm in series across the offending contacts and some 140 Volt MOV’s across the plate primary to calm down the PTT fire! Watch out here. Remember the saying “What good is a radio that cannot kill you?” Well this is getting there now. The human body makes a perfect bleeder for a 3000 Volt power supply and I do not want to be asked to help carry you to your final resting place. Besides, we would all end up bidding over your rigs on E-Bay. The next thing in the lay out is the main RF Chassis. I opted to make (4) tube sockets for the 833’s by using some surplus fuse holders, some pipe clamps and some ground rod clamps. Ground rod brass clamps also work FB-OM for the plate & grid connections of this tube. Silver Solder or Braze this stuff together so that the heat does not croak the connection. It’s time to decide on the final layout. I used bread slicers for this radio in keeping with the 1930’s type design. The inductor is a surplus Gates unit that allows the radio to change bands without a switch. I have not talked anywhere but 75 meters with this rig but my first testing under construction was on 160 meters and I have no reason not to believe that this will not work on 160 just as good as 75 if I ever get an antenna up on that band. Of course, your results will vary do to the components you collect. I managed to find most all of the pieces on e-bay for this project. Not cheap, but remember, your not getting any younger and “Old Buzzard” parts will only get more difficult to find in the future. If you build it, we will talk. When you lay out the parts make sure that you do not put your RF chokes in a position that will couple energy from the main coils into them. Right angles work here and my collection of toasted chokes proves it. Another thing to consider is that whatever you figure the part is good for, use one 4 times heavier. Hockey Puck size RF coupling cap on the 833 plates & the regular red 500 pf. units on the IPA & 833 grid. Again, lotsa smoke & exploded parts around here prove my point. I had a lot of discussion on 75 about the ability of a 100 watt transmitter to drive the grids of the 833 triodes. Forget it. Gates used some 807’s in one of their designs but that’s a very marginal setup. I checked a bunch of other BC rigs & found either a pair of 813’s or a 4-400 driving the 833’s. I chose the 4-400 because I had a bunch lying around and the tube would work fine at 3KV. Another prime consideration is not wanting to tune the IPA stage to get the rig on frequency. I decided after using every possible setup to just run the 4-400 as a grounded grid and drive the filament. This removed all of the input tuning parts and the DX-100 RF stage easily tunes into the cathode driven grounded grid 4-400. All you need is a filament choke & a few disc. Caps. Problem solved. Tunes very smooth with up to 200 mils of grid drive available to the 833’s without pushing the 4-400 past 260 mils. That’s very important. To get these triode tubes to modulate with any positive peaks you must have the high drive. The book says 100 mils per tube and 3KV for no fan operation. Nice! The next deck to construct with is the modulator. I have a couple of the RCA 1KW mod transformers that were WWII vintage MCW transmitter parts. I ran those to see if they could handle the 833’s. After testing these I came to the conclusion that they would work if I could not find anything better. My first try at a driver for the 833 modulators was to use a pair of 6146’s and a 600 ohm center taped transformer to drive the 833 grids. This worked but whenever I got on the air with any of you “Old Buzzard” broadcast types it was pointed out to me that something was not quite right. Anyway I had acquired a driver deck that came from a RCA 1 KW final that made use of a pair of 845’s. This deck also had the correct driver transformer for the 833’s. Judging from the driver iron’s size & weight I figure it’s about 150-250 watt size iron. This is very important. The driver transformer needs to be a nice low impedance high power part. If you look at the 833 power curves you can see the grid Z changes all over the place when this tube is a big audio amp. Maybe Steve’s Power FET design would work here if you could not locate the proper driver transformer. He has that posted on his site. I have the 4X 807 driver board from a Gates if anyone wants to screw around with it. Just let me know. I could not get that piece running but it’s supposed to be a cathode follower design that eliminates the iron in the driver altogether. I added at Chuck's (K1KW) urging, a shunt regulated bias supply for the modulators. This power supply was built from the ARRL handbook and modified to add one more regulator tube so it could sink the 200 mA grid current of the 833 modulators. This addition seems to have eliminated some buckshot coming out of the modulator. The next thing I'm going to try is the 3 diode limiter that's posted on the amfone site. I'll let you know how that works. The final hardware chosen for the modulator deck was the Gates BC1T transformer from Peter Dahl. Not cheap but exactly matched for my application. I experimented with mod reactors and due to space limitations I ended up with a 27H 900 mil choke and a 10H GE choke strung in series. It would be nice to have 1 amp chokes here but usually we end up with a string of 10H 500 mA chokes in series to make 40-50 H. I have also heard stories of hams using the 1 amp secondary windings of plate transformers in order to come up with the suitable reactance. My Wavetek “Meterman” Model 37XR gives an instant check of those unknown chokes. This worth buying and bringing to the festers. The Heising cap value chosen is a 2 mf. 7.5 KV Oil Cap. This & 37 H. works just fine. I had a lot of discussion on 75 considering what input circuit to use for the RF deck using a pair of 833’s. I tried a lot of possible lash ups but the hand book balanced input design with RF feed back worked just perfect. A lot of people told me that I would never get a pair of 833’s neutralized using this approach but I’m here to tell you it’s no sweat. I have a 15 pf. 9 KV tuning cap for that purpose and it uses about ½ of the cap value to tame the tubes. When your building the RF deck cut some ½” copper strap for all of your hot RF connections. Here, bigger is better. For the output cap use several small caps in parallel or one of the large “Hockey Puck” 1500-2700 pf. or so. This is another place where bigger is better. Don’t forget the RF choke across the output! If that 833 plate-coupling cap craps out you will have 3000 volts on the antenna line! For a cabinet I chose a 6 foot rack to hold all of the stuff. If I were to do it again I would probably use a 7 foot rack or a very deep one to get some more real estate for the large old buzzard components. When you put the modulator parts together make that shelf out of wood and lay down a layer of padding on top of that to isolate the frame of the iron from DC ground and to prevent the parts from modulating the cabinet. This trick also works with the power supply parts. If your filter choke is 50 years old and says 3 KV, isolate that sucker from ground or run it in the negative lead of the power supply. Just some common sense cures to allow the re-use of near terminal old swill in your combat designed radio project. Now I want to talk about the audio string feeding this transmitter. I use a Behringer B-1 studio microphone. This microphone is by no means top of the line but you can buy it brand new for $99.00 and have a reasonable microphone to start out with. The next thing you need is an audio processor to set your audio to allow the radio to actually sound like you. I purchased a used Symetrix 528 unit for about $120.00. Again, not top of the line but a nice unit to get going with. 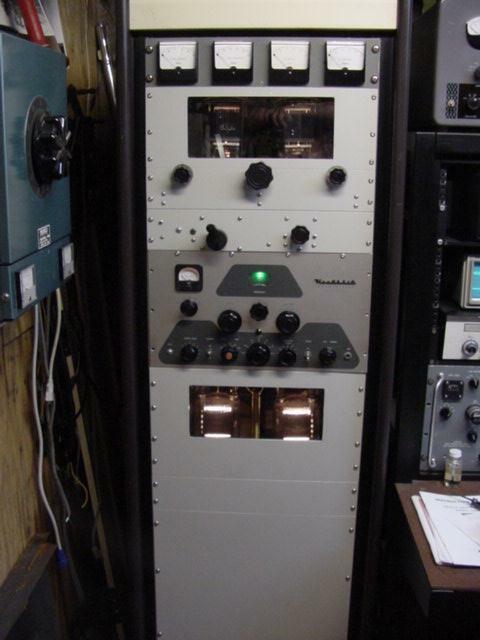 This was the setup for about a year until I added the CBS Laboratories Audiomax III automatic level controller and Volumax 400 automatic peak controller. Again these units were bought on E-bay and restored to work in my station. What I’m working on now is added the three diode negative peak limiter and “keep alive” circuit. I’ll write that up as I figure out what I need to build and test it out. You need to also consider that this type radio takes a single phase 220 VAC feed to keep it happy. I have a 25 Amp circuit breaker on the mains and internal fuses of that value to catch any problems. So far I have never blown a fuse with this rig. I have filled the basement with smoke several times due to the age of the DX-100 chassis feeding me RF but careful rebuilding of every failed part of the exciter has finally delivered a stable setup to run on 75 meters. The bottom line is that this is fun. This radio took two years to build and the cost for you to duplicate it should run from $1,000.00 to $3,000.00 depending on the size of your junk box and your ability to scrounge parts. People complain about E-bay being expensive but without that resource I would never have been able to come up with the old buzzard parts that were required for construction. Please feel free to ask me for more details about the construction and take a long look at the pictures and drawings that pepper this article. I will be glad to answer all questions to the best of my ability and point you in the direction of other “Elmers” that can help you with a project of this size. We have a lot of options today. The “Class-E” guys are building equipment all over the country and up here in New England there are several dozen 350 watt transmitters on line and several “PDM” rigs running and under construction. Anything that makes high quality AM is a good thing. 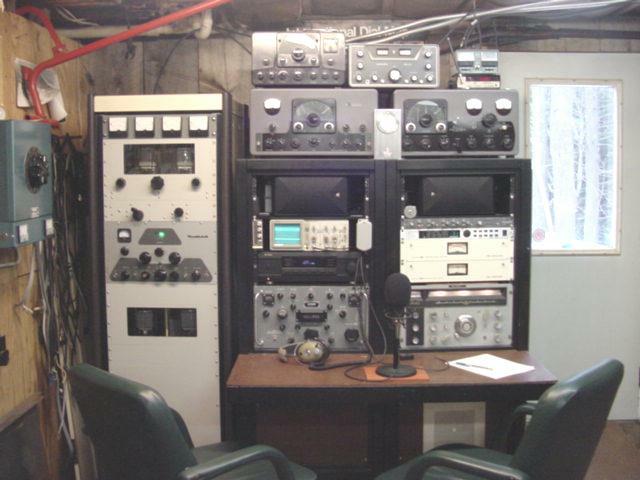 In my humble opinion the guys that get out the drill & solder station are practicing the hobby as it was envisioned by the pioneers of radio communications. Just the other night Brent, W1IA & myself were the first contacts of a new 75 meter operator that gave us a call with his virgin 75 meter antenna and SSB rig. We talked with this guy for probably 30 minutes and most likely got him thinking of the days in the 50’s that he also used to build his own equipment. I bet we hear him on AM soon.